I would neither buy nor recommend this product. Making your cleaning process easier. Having a house full of dirty dishes every night, functioning without a dishwasher in a busy household is not really an option for my family. 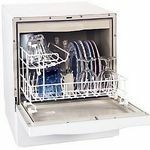 We purchased the Danby Portable Dishwasher while living in a home that did not feature a dishwasher. This dishwasher was a little higher in price than I would have liked, but after reading the reviews for this dishwasher we decided to buy it regardless. 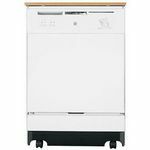 This dishwasher fit in well in an open spot within our kitchen, but also worked well when ran daily. It cleaned the dishes adequately and while the cycle did take a while, the dishes came out clean. I would not recommend this dishwasher for heavy use with heavily dirtied pots and pans, as it did not remove all the debris. It made a little bit of noise when washing the dishes, but wasn't extremely loud and allowed my children to sleep without waking them as their room is in close proximity to the kitchen. 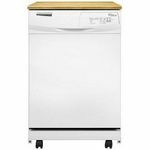 I highly recommend this dishwasher if you don't have space for a full size unit within your kitchen. We bought our first 18" Danby in February and it stopped pumping water a month later. It was under warranty so Danby replaced the unit (because there wasn't a repair store withing 100 miles of us) and didn't take back the broken unit due to the expense of transporting it back to the store. The newer unit started leaking water within a month of using it. We continued to use it too long, it is now out of warranty and the unit now floods the kitchen floor. As of today we have two broken danby's out in our drive way, both of them only a few months new. I will never buy anything from that company again. Be sure to check to see if there is a repair service available before purchasing any product. 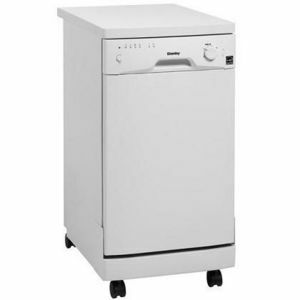 I give this dishwasher overall 9 rating because of its convenience and portability. However, the only thing I have to say about this dishwasher is I wish there were more space for my pots and pans. Loading the dishes and running this dishwasher is so easy even my 10 year old can do it. We have found that we can manage to get plates and cups stacked up with ease. The best thing I can say about this dishwasher is it's so convenient to move from my upstairs kitchen to the kitchen in our basement. Which makes washing dishes not so much of a hassle anymore in our household. We do have to wash our pots and pans in a separate load from other dishes. So if you have a large family using a large amount of dishes, I wouldn't recommend this particular one. Design Having wheels on the bottom of this dishwasher makes it easier for me to bring the dishwasher closer to the sink for loading. Overall, I would have to give this product a ten out of ten rating, because it is so impressive! 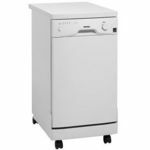 It is a high speed, very spacious dishwasher. It makes cleaning dishes so easy and simple. You can get the job done with this product in less than a half hour! 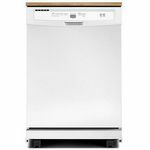 The Danby portable dishwasher is easily accessible, and it can be moved to wherever you would like it to go, because it is not that heavy of a product. It makes hardly any noise, and it gets your dishes squeaky clean. What is not to love about it? I would definitely recommend this dishwasher to anyone in search of a great product and a decent bang for your buck! Noise Level This dishwasher hardly makes any noise, so I was very impressed by it. Cleaning Time Your dishes will be clean in almost no time at all with this product. Loading Flexibility The amount of dishes that you can fit in this dishwasher is almost overwhelming. I can fit almost double the amount of dishes in this than my old dishwasher, which is very pleasing to me! Performance This product performs greatly. Design I really like the design of this dishwasher. Durability This is a very durable dishwasher.